SUN 13 JAN 2019 08:52 PM. Experts working on the Staffordshire hoard have recreated one of its great treasure, a rare gold helmet, revealing for the 1st time the spectacular impression its original wearer would have made. The hoard, found by a metal detectorist in a field near Lichfield in 2009, is the largest collection of Anglo Saxon gold and silver metalwork ever found. But while the quality of its workmanship was exceptional, most of its items were deliberately bent or broken into more than 4000 pieces before being buried in the ground in the 7th century. 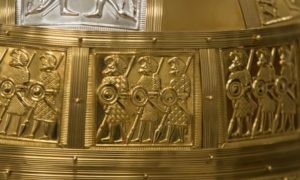 A 3rd of the pieces were found to belong to an ornate Anglo Saxon helmet – an exceptionally rare find as only four other examples have ever been found. With some of the fragments only a few millimetres in size, But, it would never have been possible to reconstruct the original. Instead its conservators, working with the school of jewellery at Birmingham City University and experts in woodworking, leather and metal working, have created 2 replicas to be housed in museums in Birmingham and Stoke-on-Trent, which jointly own the hoard. Pieta Grieves, one of the conservators, said the reconstruction, which emerged from a research project partly funded by Historic England, was a very slow process. Eventually they were able to work out its basic structures, built on a steel frame with a leather liner and covered with gold panels (and one made of silver) showing beasts and warriors standing with their weapons or bowing to show fealty to their king. As the helmet was missing its frames and key decorative sections, parts of the replicas have relied on what Grieves called “an academically respectable guesstimate” of what the original probably looked like, based on comparisons with other Anglo Saxon, Scandinavian and Roman examples. 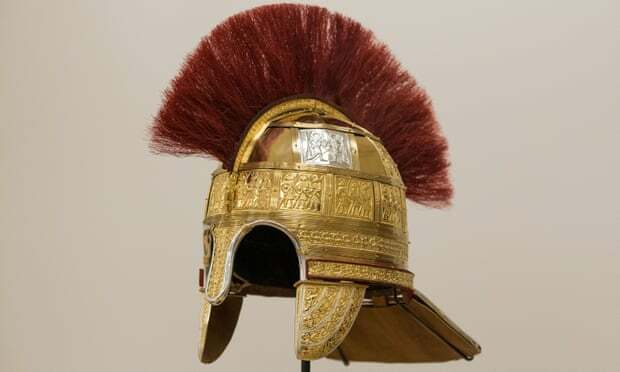 The replica is notable for its striking crest of red horsehair, which differs dramatically from the dragon like creature on the crest that tops the Sutton Hoo helmet, for example, which expert’s believe was made around the same time in a similar area of eastern England. Grieves, who has worked on the hoard since 2013, said there was no direct proofs that crest was topped with horsehair – “feathers are another option” – but its open style crest was unique among Anglo Saxon examples and “gives it a Roman look”. She said she hoped the replicas would help to bring the hoard alive to visitor’s. “It is quite hard sometimes to understand the hoard as a lot of fragments.